Internet memes offer us a crooked reflection of ourselves and our times, sometimes perpetuating stereotypes, sometimes highlighting uncomfortable truths. In recent years, a little ill-drawn circle called Polandball has gained world fame quasi-instantaneously, and an overview of the phenomenon reveals how and why. To start off, a few explanations for the laymen: an Internet meme is defined by Merriam-Webster as "an idea, behaviour, or style that spreads from person to person within a culture". In popular parlance, they describe images that quickly overtake the popular web sphere – the so-called viral effect. They mostly spread out through image-boards, Internet forums that allow posting images easily. 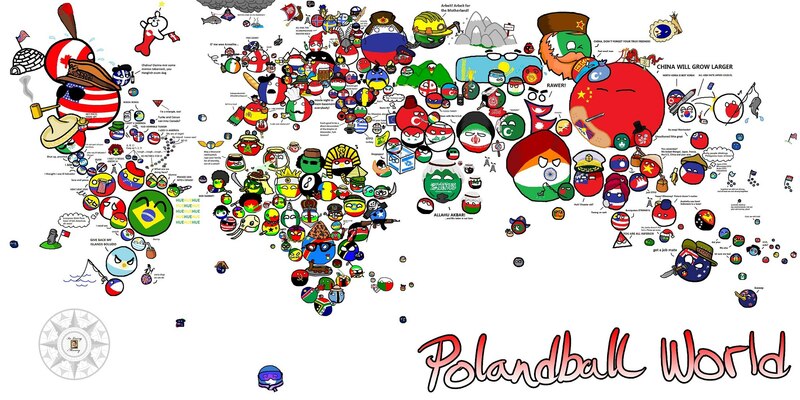 In this case, the meme at hand is a series of cartoons where countries are represented as balls in the colours of their national flag, with Poland as central character. The comic element relies mostly on national stereotypes and on ‘lolspeak’, a type of Internet slang, which originates from ‘lolcats’ – memes with cats speaking in a misspelled and deliberately incorrect English. Polandball has its own brand of lolspeak, and only Anglophone countries speak with good English. Other countryballs speak a farcical rendition of their own language into English. 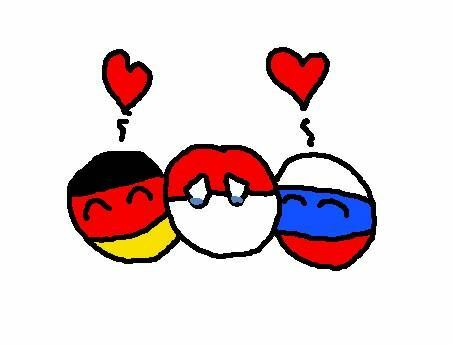 For example, Polandball speaks in an English that mimics Slavic grammar, and confuses the finer points of English usage. ‘Of’ and ‘is of’ are often randomly introduced in sentences to make them sound clumsier: ‘ Poland is of happy today’. Another leitmotiv is the phrase something can into something, its most popular form being ‘Poland cannot into space’ (Poland’s grievance against not having a space program), or ‘Greece cannot into monies’ (no explanation needed). Polandball was born out of a strange cyber war that took place in August 2009. On Drawball.com, a website which allows users to draw on a huge circular canvas, a group of Polish Internet users somehow coordinated their efforts to take over the ball. It required massive participation as one single user has a very limited amount of virtual ink. Despite many attempts to block the assault, Polish users managed to paint it entirely white and red, and even wrote ‘Polska’ in the centre of it. Caption: Watch the time-lapse video of the takeover. Polish assault starts at 3:30. The Drawball.com takeover inspired a British user, nicknamed FALCO, to create the first Polandball story in order to mock a Polish user called WOJAK, who participated in the forum with less than stellar English. FALCO used basic MS Paint tools to draw a ball resembling an inverted Polish flag, who spoke the Poglish that became Polandball’s trademark. Immediately, Russian users jumped on the bandwagon and started drawing their own memes. The idea of ridiculing international stereotypes turned out to be so catchy that it soon resulted in the creation of hundreds of Polandball stories. Polandball World. Click on the caption to enlarge. The universe of Polandball is subject to very strict rules concerning the look, habits and language used by each of the countryballs. Israel is always a cube, Great Britain has a monocle and a hat, Brazil never stops laughing, etc… there are thousands of them. 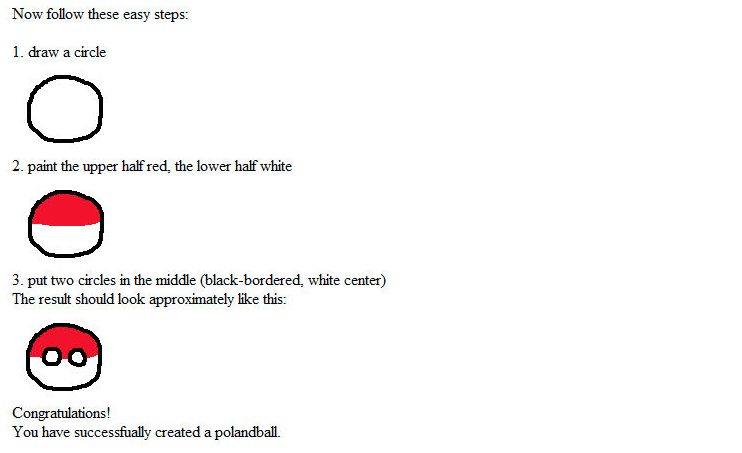 Polandball also has its defined set of characteristics. Its colours are always inverted – red on white instead of white then red like on the Polish flag. (This was probably FALCO’s way to taunt WOJAK and to attack the reputed touchiness of Poles when it comes to confusing ‘Poland’ with ‘Holland’, Solidarność with Perestroika and our flag with the Indonesian or Monegasque ones.) The countryballs are all limbless and featureless, hand-sketched with a brush tool, giving them a pitifully handmade look. Personality-wise, Polandball seems always lost, asking irrelevant questions and complaining about its lack of importance. It often needs help and calls for it by crying ‘HALPINGS!’. Its biggest dream is to ‘can into space’. By now, an astute reader will have a clear idea of the type of stereotypical Polish behaviours Polandball exhibits. Let us then have a critical look at the image the little red and white ball puts forth, and compare it with reality. While linguistic performance widely varies from one individual to another, in the latest research by Education First (an international organization that monitors education systems in Europe) Poland was ranked 10th out of 46 European countries with a fair result of 59.8/100. Admittedly, there are still proud speakers of the heavily accented variety of English which has spawned so much laughter. English was thought to be the language of ultimate evil during the communist era (between 1945 and 1989) and it was highly recommended to learn Russian instead. A large number of well-educated people in their fifties or sixties struggle with English since they started learning it so late in life. It is also true that English pronunciation is troublesome for all Slavs. Our ‘sz’, ‘cz’, ‘rz’ are far removed from the English ‘th’. 2. 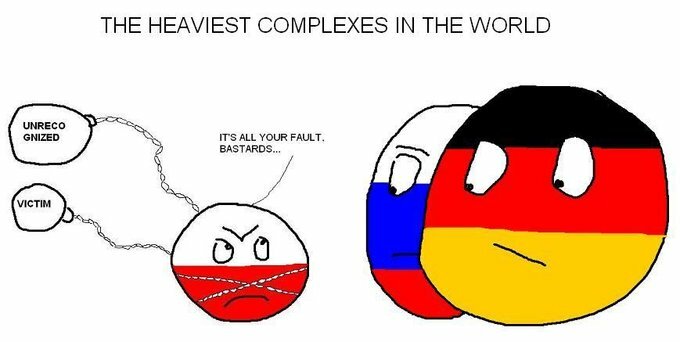 Poland is full of complexes, and blames everybody else for its failures. True, but partially justified. Poland is located between Russia and Germany, and has had a hard time with its neighbours since the 18th century. In 1795, along with the Austrian Empire, they conquered Poland and divided it into three parts. Poland then regained independence in 1918 only to be simultaneously invaded by Nazi Germany and Soviet Russia in 1939. 3. Poles enjoy telling stories about Poland’s glorious past. Understandably, this is mostly true. There is an entire mythology built around Poland’s battle for independence, always fighting against stronger invaders, ruling the land ‘from sea to sea’ (from the Baltic to the Black Sea) few centuries ago, and courageously preserving its language and culture despite many attempts to wipe it off from the face of the earth. During history and literature lessons, we are taught about Polish victories, moments of glory (we had quite a few) and dramatic uprisings. Martyrdom is deeply rooted in our self-awareness and a slightly intemperate self-esteem is being inculcated in every Pole from the very beginning of his or her education. In all likeliness it is that very mindset that provoked the Drawball.com takeover. This is a strong exaggeration on both counts. Catholicism has played a huge role in Polish history: the Polish state begins with its baptism, clergy was the source of all knowledge for Polish rulers, Poland had several notable saints along the way and finally, during the 20th century, the Church was one of the decisive factors in regaining full independence in 1989 (with a major contribution from Polish-born Pope John Paul II). For all these reasons, Catholicism is still strong in Poland. Most people live their faith privately, but in any group there are always some with an irresistible craving for externalizing. The Polish village of Świebodzin made headlines worldwide when a statue of Jesus (bigger than Rio’s) was built there. From that day onwards, the rest of Poland has been calling the village Rio de Świebodzineiro and the world has never stopped laughing. Polandball is the story of one guy creating a worldwide phenomenon by making fun of another guy, creating a new format of expressing one’s views on nationality, race, language and recent history along the way. Why did it become so successful? Maybe because the basic rules that apply to Polandball offer every creator a good basis for developing a funny story, yet offering very few restrictions. The stories can be rude, impolite, racist, abusive, or just plain dumb. Their disrespectful stance towards political correctness makes much of their attractiveness. They are the embodiment of the Internet par excellence. Polandball memes function almost like some sort of cultural genes – they self-replicate, freely mutate, and respond to selective pressures. This is what makes them grow more and more popular and recognizable. 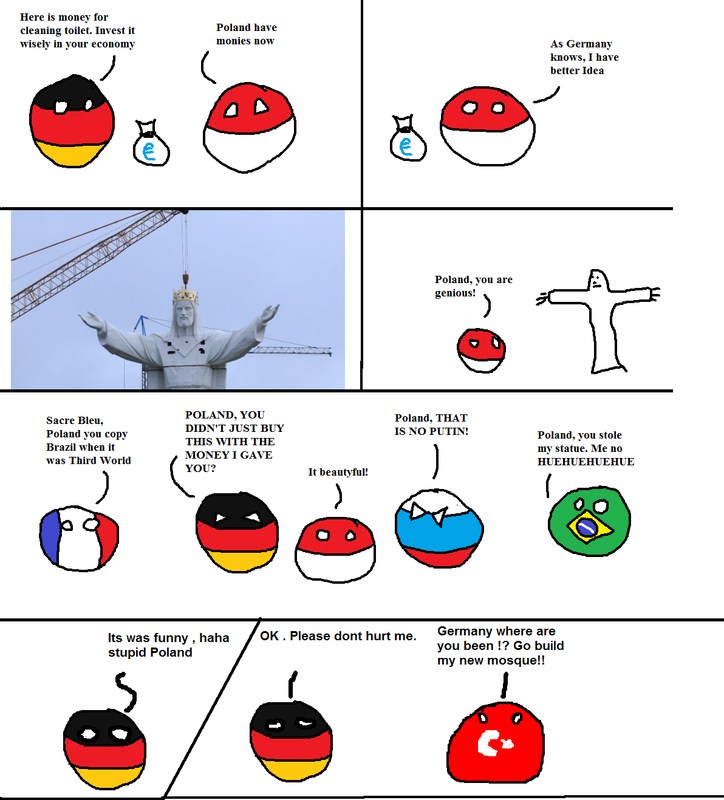 Is there anything Poland itself can learn from Polandball? Perhaps a lesson in having a sense of humour about our long-time grudges, if nothing else.